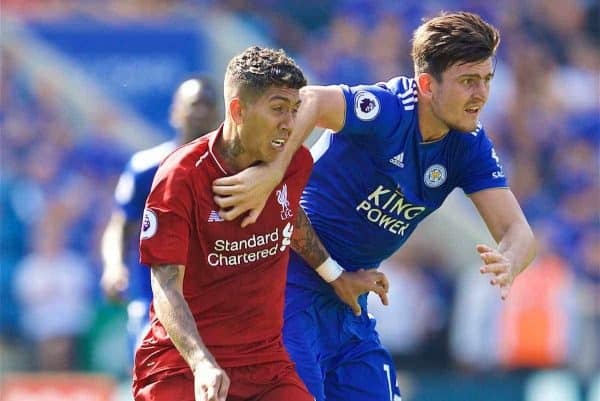 Liverpool face Leicester City at Anfield in the Premier League on Wednesday evening, looking to extend their lead at the top to seven points. Here are all the best facts and stats ahead of kick-off as the Reds get back in action. Last season the Reds did their first league double over Leicester since 2001-02 and their third in the Premier League era. They look to add to that tally this evening. In this fixture last season, Liverpool came from behind to win 2-1 after Jamie Vardy struck first in the third minute. The Reds won the points with two second-half Mohamed Salah goals. In the last five league meetings home and away, 20 goals have been scored with the Reds responsible for 12 of them. Liverpool have lost two of the last 13 league meetings, winning nine with two draws. In the Premier League era at Anfield Liverpool have won seven, lost three with two draws. The Reds first-ever game in front of the new Main Stand came against the Foxes with the hosts winning 4-1 in September 2016. Liverpool’s next goal will their 100th scored against the Foxes in all Anfield meetings. Salah has found the net three times in his three Reds appearances against the Foxes. Roberto Firmino has also netted three against today’s visitors. Robbie Fowler has scored most for the club against City in the Premier League (five). 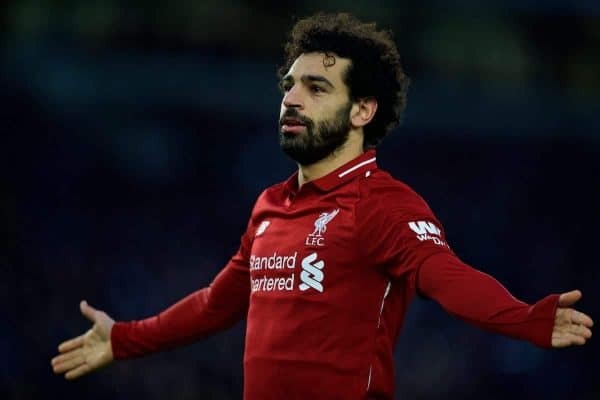 Salah’s next goal will see him become the first Liverpool player since Luis Suarez in 2013-14 to score 20 league and cup goals in successive seasons for the club. The Egyptian is two goals short of recording 50 in the league for Liverpool. Against Palace he reached the 50 landmark in 72 Premier League games with only Andy Cole (65), Alan Shearer (66) and Ruud van Nistelrooy (68) doing so in fewer appearances. 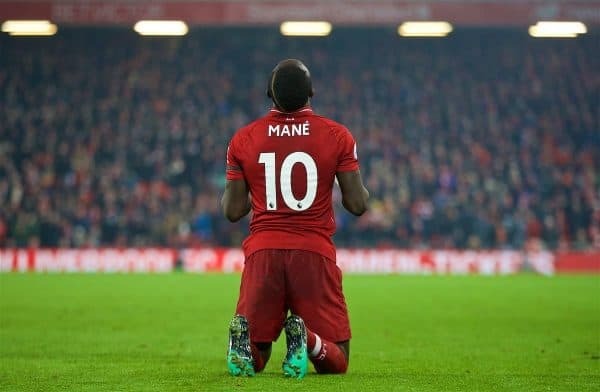 Sadio Mane has had a hand in four goals in his last four games against Leicester, with two goals and two assists. He has scored in 22 games at Anfield for Liverpool in all competitions with the Reds winning them all. 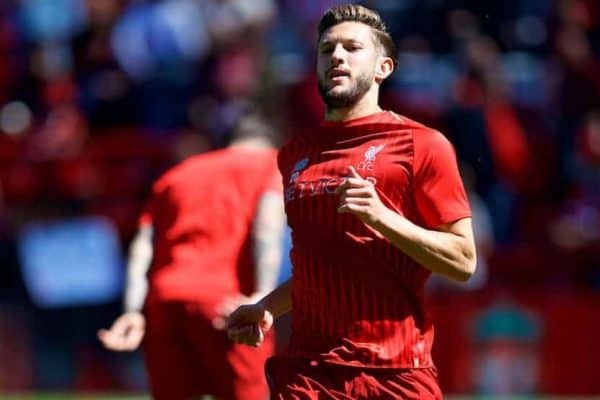 Adam Lallana could play his 150th game for Liverpool in all competitions, if selected. 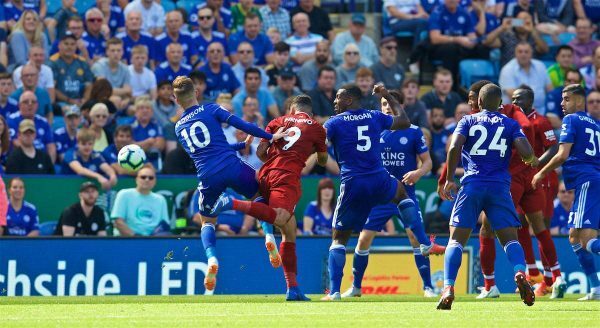 Jordan Henderson‘s last goal for Liverpool came in the 3-2 win at Leicester in September 2017. Alisson has kept 13 clean sheets in the top-flight this season, the most by any Reds keeper in one season since Pepe Reina (14) in 2012-13. Liverpool have won now seven home league games in a row—they had last done so in January 2014. Another three points this evening will see them record an eighth in succession for the first time since March 2010. 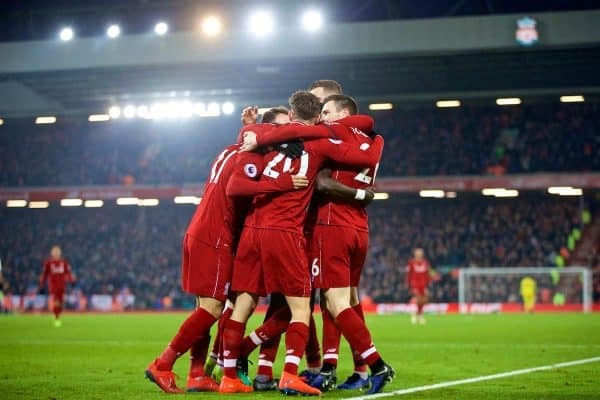 In their last outing against Crystal Palace the Reds conceded three goals in 61 minutes—as many goals as they have shipped at Anfield in their previous 15 top-flight home games. They have kept 12 clean sheets in the last 17 home league games. The Reds currently have accrued one more point in this campaign than at this stage of any season in their history. They had 59 points from 23 games in 1893-94 (adjusted to 3 for a win) and again in 1987-88. 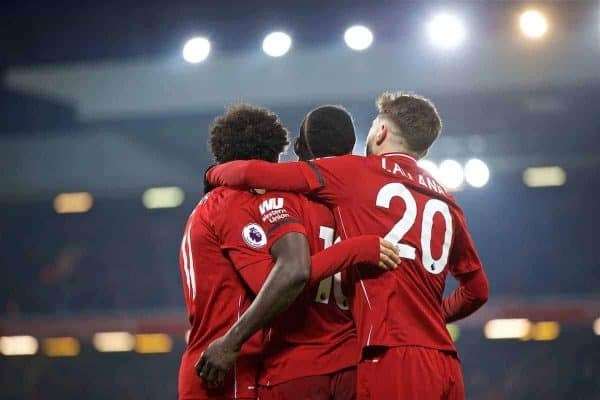 Liverpool have lost four of their last 52 league games, while in the last 38 matches—which would constitute a full league season—they have picked up 88 points, winning 27 of those fixtures. They have failed to find the net in only one of the last 24 league matches, at home to Manchester City in October. The Reds are unbeaten at home in the last 32 league matches (23 wins and nine draws). It is their best since 1981 when their club-record run of 63 without defeat was ended on January 31st by…Leicester City. Since winning the league in 2015-16 Leicester have finished 12th and, last season, ninth. In the last four campaigns they have amassed 41, 81, 44 and 47 points. Jamie Vardy has scored seven of Leicester’s last 10 goals against Liverpool but missed the game at the King Power Stadium back in September due to suspension. Vardy has scored on each of the last five occasions he has lined up against the Reds. He is one of seven players to have scored seven times against the Reds in the Premier League. Only two men have scored more: Andy Cole (11) and Thierry Henry (eight). Vardy has scored 13 goals in his previous 16 games against the “Big Six” in the Premier League. Claude Puel has lost his last two as manager against Liverpool after being unbeaten in his previous six with Southampton and Lyon. The Foxes have earned 17 points away from home this season compared to 14 won at the Kingpower. Liverpool: Salah 19, Firmino 11, Mane 10, Milner 5, Shaqiri 6, Sturridge 4, Origi 2, Alexander-Arnold 1, Fabinho 1, Lovren 1, Matip 1, Van Dijk 1, Wijnaldum 1, own goals 2. 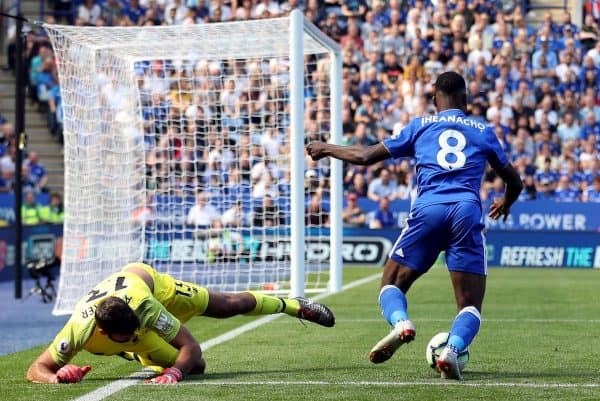 Leicester: Vardy 7, Maddison 5, Albrighton 3, Ghezzal 3, Gray 3, Iheanacho 2, Maguire 2, Ndidi 2, Ricardo Pereira 2, Fuchs 1, Iborra 1, Morgan 1, own goals 3. * All statistics courtesy of Liverpool statistician Ged Rea (@ged0407).